The Capcom team certainly has been busy this past year with regular content updates and events for Monster Hunter: World, and that will be continuing into the new year. Among the planned free content updates are a crossover event with everyone's favorite hunter of monsters, Geralt of Rivia, a festival to celebrate the past year, and some other secrets for the 15th anniversary. Arch Tempered Kulve Taroth - this unique monster hunt lets a total of 16 hunters (still divided into groups of 4) to take on a behemoth that drops special rewards. The "Arch Tempered" version presents a greater challenge to hunters as it is more aggressive in its attacks, gets enraged more often, does more damage, and is more resistant to Flash Pods. For this version of Kulve Taroth, there will be an additional challenge/incentive for hunters as you can trigger a special fury state by fulfilling certain conditions before you break off its armor. If you manage to do that, then you can reap even greater rewards. This limited time hunt starts today at 8:00 PM EST, and concludes at 7:59 PM EST on January 3. Appreciation Fest - as a thank you to all the Monster Hunter fans and to celebrate its one year anniversary, there will be a special "Appreciation Fest" event that starts sometime next month. Like past themed events, hunters can expect some decorations in the "Gathering Hub," some new outfits and quests, and new food to eat. Arch Tempered Nergigante - as if the regular version wasn't annoying enough, there will be an arch tempered version of the "big bad" coming sometime next year. Not much was shown or detailed other than an image, so you can go ahead and start thinking up all the nightmare scenarios where your hunt will be wiped by his "drop of doom" that will probably add on some kind of nuclear blast just to ensure there's no hope of escape from it. Witcher Crossover Event - similar to the Mega Man and Street Fighter collaborations, Capcom will be bringing another iconic video game character to the world of Monster Hunter. This time, it's the star of the Witcher series, Geralt of Rivia. It's not entirely clear what this collaboration event will entail, but based on some of what's shown off, you may have the opportunity to actually play as the famed Witcher himself. Capcom also promises some unique quests that will blend some of the Witcher series RPG mechanics with the systems of Monster Hunter: World. No release time frame for this, unfortunately. The biggest announcement, of course, was saved for last. 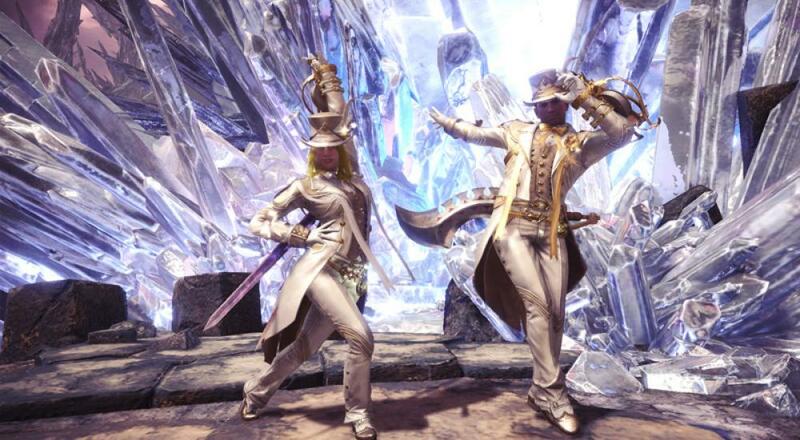 If these limited time events aren't enough for you, then you'll probably be interested in the "Iceborne" expansion. This paid DLC will add new monsters, new gear to craft, a new area to explore, new quests, and a new storyline. It also seems likely that it will add a new rank of quests above the current "High Rank," perhaps even the often fan requested "G Rank," where monsters are even tougher and have new attacks to ruin your day. Again, sadly, this will arrive on consoles first and PC sometime later. More details will be revealed in the next few months. Monster Hunter: World is available now on PC, PlayStation 4, and Xbox One. Page created in 0.2342 seconds.